We were engaged by Camden Airport to undertake a range of habitat enhancement activities for the threatened Eucalyptus benthamii, commonly known as the Nepean or Camden White Gum (that can be seen in the photo on the left), and Pomaderris brunnea, (Brown or Rufous Pomaderris) within sections of Riverflat Eucalypt Forest along the Nepean River. This has included woody weed control of African Olive and Broad and Small Leaf Privet (Ligustrum lucidem and L. sinense), as well as the control of African Lovegrass (Eragrostis curvula). Some site progress photos can be seen below. 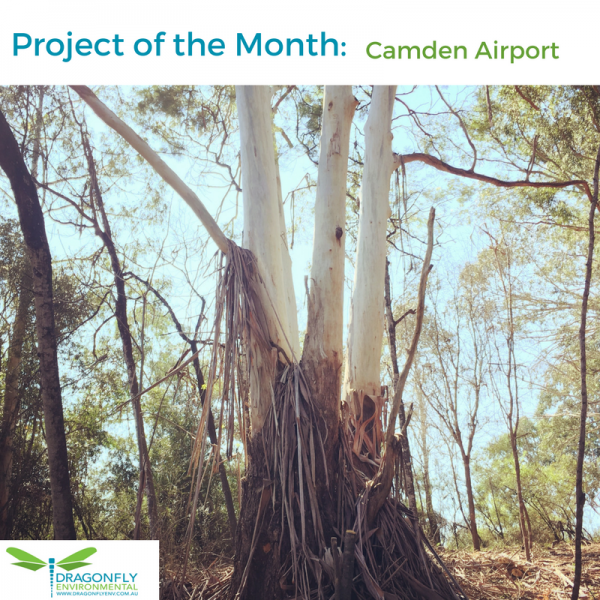 Camden Airport have engaged us with grant funding they received from the Greater Sydney Local Land Services (GSLLS). Our crew enjoy the varied native fauna sightings that has included Wallaroos, Swamp Wallabies, Eastern Grey Kangaroos and Whistling Kites. There are also wombat burrows galore, and GSLLS have been undertaking wombat mange control by placing a flap that has the chemical known to treat mange (Cydectin) over the burrows. We recently installed a fence around the vulnerable Pomaderris brunnea (listed as endangered under NSW state legislation and vulnerable at the Commonwealth level) to protect it from predation by feral goats (the finished product can be seen in the photo below). Brown or Rufous Pomaderris is a shrub that grows up to 3m tall with branches covered with long brown hairs over soft-whitish hairs. Leaves are elliptic and glabrous and dark green above with dense tan and white hairs are present on the underside of the leaf. The flowers are small and cream, borne in small, dense clusters and without petals but with 5 hairy sepals. This species is restricted to the Sydney district where it grows in 2 widely separated populations. It grows in creek lines and flood plains and prefers clay or alluvial soils over shale, generally in open woodland. The species is expected to live for 10 – 20 years, while the minimum time to produce seed is estimated to be 4 – 6 years. As these populations have not been seeding readily, we have also experimented by hand-pollinating selected branches of the P. brunnea flowers. These have been bagged so we can identify if we have been successful as we enter Summer. The other species we have been protecting is Eucalyptus benthamii, the Nepean or Camden River Gum. It can grow up to 40m tall, as can be seen in the small population surviving at Bents Basin along the Nepean River. This handsome and majestic tree grows only on sandy and alluvial soils of river valleys to the south-west of Sydney. Much of the original habitat has been submerged due to the establishment of Warragamba Dam and as this species seems to rely on river flooding to germinate, regeneration has been limited due to flooding decreasing along the river since 1935 when the Nepean Dam was completed. It flowers from March to May in white buds in clusters of seven. It is listed as vulnerable under Commonwealth legislation and vulnerable under NSW legislation. Populations are known from Reedy Creek , Kedumba Creek and Cedar Creek in the Blue Mountains National Park and a number of individual trees are scattered along the Nepean River between Wallacia and Camden, where we are working! Seldom Seen – Rare Plants of Greater Sydney by Alan Fairley, 2004. Field Guide to the Native Plants of Sydney by Les Robertson (3rd Edition), 2003.